It is often said that a turbo charger fitted to a diesel engine is a mechanical marriage made in heaven, this union is found in everything from a tractor to a heavy duty truck. There are two ways and engine can breathe, it can consume air naturally vis the differential pressure in the cylinder bore versus atmospheric pressure (Naturally Aspirated) or an engine can have air forced into its cylinders through the use of a turbocharger or supercharger. The two methods of forced induction differ in how they are powered, a supercharger is driven from the engine’s crankshaft and consumes power whereas a turbocharger uses the exhaust gas exiting the cylinder to operate and requires no power form the engine. The turbocharger accomplishes two things. The use of a turbocharger improves the volumetric efficiency of the cylinder fill, naturally aspirated engines achieve 80% efficiency whereas turbochargers improve to 100%. What is wonderful about turbocharging is that the power gain is passive, the gain is only there when you need it. Many turbocharging applications also employ a heat exchanger either an intercooler or a charge air cooler (CAC). The purpose of a CAC is to cool the charged air, which, in turn increases the density of the air being sent to the cylinders, the CAC also helps reduce the heat caused by the act of turbocharging, hotter air is undesirable to engine performance as it contains fewer oxygen molecules than cooler air, for every 10 deg F change in air temperature, power is altered by 1%. A turbocharger primary component is and exhaust driven turbine wheel. That wheel is contained in volute which is a snail-shape housing, the turbine wheel is also connected via a shaft to another volute that contain a centrifugal compressor wheel that sends the charge air to the intake manifold. The turbine side of the turbocharger is considered hot whereas the compressor side is cold. 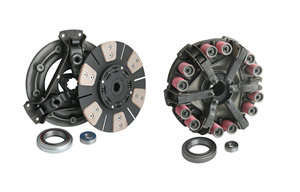 The shaft that connects the wheels is supported by a bearing housing that is fed engine oil under pressure. 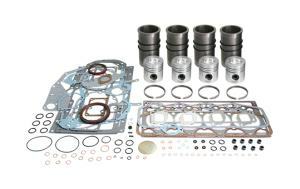 That oil flows through the housing draining back to the engine via the sump pan or timing cover. The shaft bearings are of the floating type, earlier turbocharger designs used semi-floating or pressed in ball/roller bearings. Under high boost conditions the shaft/turbine and compressor wheel can rotate at speeds as high as 150,000 RPM. Due to the exhaust heat at the turbine, many models also send engine coolant through the bearing housing to improve service life and reduce coking of the oil. Seals are used in the turbocharger to keep oil away from the exhaust and inlet passageways, they also contain the spent gases and boost pressure in the volute. Turbochargers can vary the manner by which they control their boost pressure, either by the use of a wastegate valve or can consist of movable rings with vanes on the turbine side. A wastegate allows exhaust gas to bypass the turbine wheel and housing and, thus limits its speed. The energy that rotates a turbocharger’s turbine wheel comes from the hot exhaust gas leaving the engine’s cylinder. The turbocharger is passive since it responds to a much lesser extent to engine speed than exhaust temperature. That is why you hear a turbo spin up when the engine is loaded, even though there may be little increase in engine rpm. 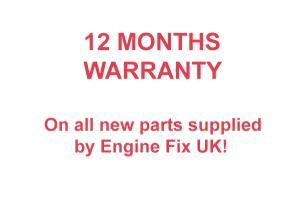 As the load on an engine increases, so does the exhaust temperature and its velocity. When the exhaust leaves the port of the cylinder head, the inert gas experiences isentropic expansion, the hot and expanding gases are forced into the turbine housing and act on the turbine wheel in the same manner as the flow of water through a water mill, the compressor wheel then feeds air into the intake manifold under pressure with a resultant increase in volumetric efficiency, horsepower and improved emissions. A turbocharger is a key component of the engine and is designed and manufactured to last the life of the engine with proper preventative maintenance, it is not to say that turbos don’t fail. When they do, 90% of the time the failure can be diagnosed as the turbocharger ingesting a foreign object or due to poor maintenance. Foreign objects will damage, if not destroy a turbocharger, it is paramount that the air filters are changed faithfully in line with the engine manufacturers recommendations. 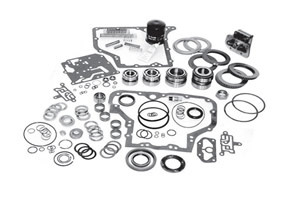 Changing filters has the added benefit of preventing excessive drop in air pressure across the filter and a vacuum at the turbochargers compressor oil seal which in the long term will damage the seal. 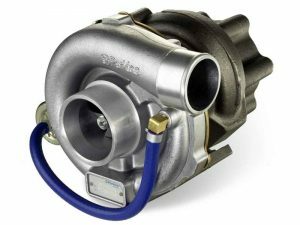 Another general tip for extended turbocharger life is to let an engine idle for a minute or so after hard running, this allows the turbocharger slow down while cooling down, use of this old tried and trusted procedure will result in extended turbo life. When dealing with lack of power, first determine if the engine is operating correctly, if the engine runs well, then there is an excellent chance that the fault is in the turbocharger system. 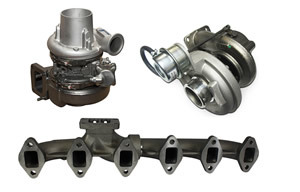 In determining what’s making the turbocharger perform badly, check all inlet connection for an air tight fit from the turbocharger to the engine, loose hoses clamps or faulty hoses will let boost escape. During the examination of the turbo look for tell-tale signs of an exhaust leak upstream from the turbine housing back to the engine. Any exhaust leaks will limit the turbo performance since not all exhaust gas is flowing into the turbocharger’s turbine this in turn degrades its ability to compress the combustion air. When looking at the system be sure to check the integrity of the turbocharger’s intercooler, a common fault is to get a crack in a tank or a small pin hole in a tube, trucks are particularly susceptible to this. If the oil seal in the turbo’s compressor fails, it will force lubricant into the charge air cooler, wash the lubricant out since it will not only cause excessive exhaust smoke but will severely limit the thermal conductivity of the unit. On a turbocharger with a wastegate device you need to confirm that the gate is not stuck open, a stuck open wastegate can starve an engine of power or cause it to slowly build boost. During the examination, check the integrity of the line that connects to the turbo’s diaphragm, which senses boost, if that line is cracked or leaking, this will cause the engine to overboost. If your turbo is a variable vane turbo look for carbon build up in the vanes which could lead to the vanes sticking and as a consequence solenoid overload and failure . If the turbocharger has had a bearing or seal fail, check the integrity of the oil feed and drain holes to ensure they are not clogged up with sludge. Check the compressor inlet to see if impeller damage is evident. Also check for excessive oil film and smooth movement of the shaft. Keep in mind that if the turbo you are checking has a floating bearing there will be movement evident, however if the movement is sufficient the cause the fins to hit the housing the wear is excessive and the turbo needs repair work.